HEALTH experts are furious after McDonald's launched a toy set for kids to pretend they are flipping burgers at a drive-through. The Â£59.99 kit has Happy Meals with plastic patties, buns, cheese slices and pickles. Chips are prepared in a toy deep-frier that makes a sizzling noise. There are also plastic chicken nuggets and desserts in the set sold by Toys R Us. Tam Fry, of the National Obesity Forum, said: "It's yet another example of big business infiltrating the minds of children." Toy expert David Smith said: "It's disturbing. It's better than free advertising - they're actually making us pay for it." 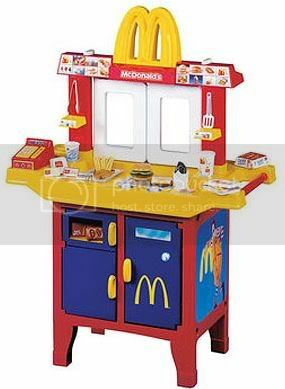 A McDonald's spokesman said: "It is meant as a fun role-play toy." Quote: The Â£59.99 kit has Happy Meals with plastic patties, buns, cheese slices and pickles. Plastic eh? Must taste just like the real thing then. Maybe its designed to make a minimum wage gig seem attractive to children, with the economy in the toilet for the next 20 years minimum wage is all they have to look forward too. Â£59.99? that's like $110 insane. For a cheap ugly lump of plastic. Sad thing is though people will buy it. They buy their food don't they? Good morning Shadow! How bout an egg McMuffin and hash browns? (03-02-2011, 02:26 PM)Octo Wrote: A McDonald's spokesman said: "It is meant as a fun role-play toy."